If you are in need of an appointment outside of office hours, feel free to fill out the following anonymous form: goo.gl/forms/p8ZznNC0T3l1T94C3. We want to hear from you and support you however we can. You are not alone. Our email, qrcbrandeis@gmail.com, is checked daily. Feel free to email us to set up a time to meet if you're unavailable during our office hours or for any information or to schedule a rainbow rap. 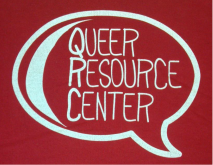 We are located at the Gender and Sexuality Center (Usdan G105 in the Weiner Lounge), and our phone number is 781-736-8583. Don't forget to check us out on Facebook, Twitter, and Tumblr!